A strongly built rover, Viv Valentine was one of a number of Tasmanians to leave a significant mark on Victorian football in the years leading up to World War One. Born and educated in Launceston, Valentine first played senior football with the Launceston Football Club in 1906. In his first season he equal topped the NTFA goalkicking table with 12 goals and made such an impression that he was selected as second rover alongside fellow Hall of Famer Harry Coventry in a combined Northern Tasmanian side that played VFL team Collingwood late in the season. After making his debut for the Blues in Round 2, 1911 Valentine set about making an immediate impact on the VFL. 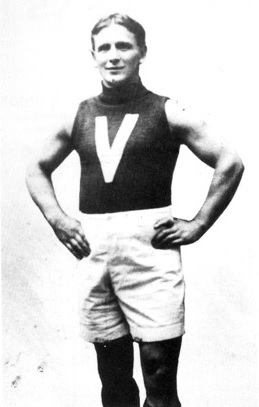 A prolific debut year saw him selected in the Victorian squad for the 1911 Carnival in Adelaide, while in his first finals match he was almost unanimously voted as best afield in the Blues’ semi final loss to Essendon – the first VFL match in history to feature player numbers on guernseys. By season’s end he had established himself as a vital member of what would become a highly successful Carlton team. His success came from a mixture of unwavering determination, flawless skills and in particular great physicality, with one writer of the time famously describing him as “a moving mass of muscularity”. Valentine’s peak came during the war years from 1914-18. After unfortunately missing Carlton’s 1914 premiership due to a persistent leg injury, Valentine was present the following year when the Blues snared their second consecutive premiership with a 33-point victory over Collingwood, with Valentine and ruckman Charlie Hammond dominating the centre of the ground. He continued his good form in the war-enforced four-team competition of 1916 and 1917, but despite his best efforts he was unable to taste any further premiership success, with Carlton yielding to Fitzroy in the 1916 decider before consecutive semi final exits in the following two years. After the Blues’ heartbreaking five-point semi final loss to eventual premiers South Melbourne in 1918, Valentine retired as a player after 116 games, 91 goals and – perhaps unluckily – just one premiership medallion. He was immediately appointed Carlton coach for the 1919 season, becoming the first Tasmanian to ever coach a VFL side. That season he guided the Blues to a semi final appearance and also coached the Victorian state team. After being awarded life membership of Carlton at the end of the 1919 season, Valentine returned to his native Tasmania where he continued to contribute to the game at grass-roots level for many years before his death in 1967 aged 80.